Skinwalkers Fantasy Pack includes all three novels in HIP’s Skinwalkers series: Legend of the Ring, Walking Both Sides, Wolves at the Gate. This discounted series offers three novels for the price of two. Each of these novels tells a separate story of teenage characters involved with Skinwalkers – creatures who can shape-shift between human and animal forms. 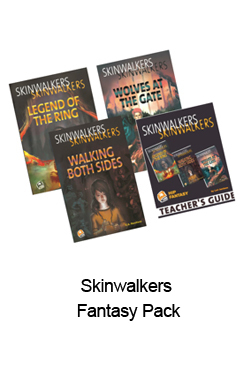 Skinwalkers Series Teacher’s Guide PDF included.